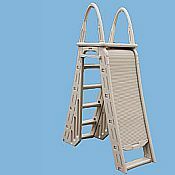 The Model 7200 Roll-Guard fits pools from 48"-56" Above ground pools and will accommodate a top rail of up to 14". The new Roll-Guard Barrier prevents unauthorized pool entry when in the closed position and restricts access behind the ladder when in the open position. The Roll-Guard Barrier's easy and unique roll-up and down design (similar to a garage door) eliminates the need to flip up or spin the outer treads of the ladder to restrict access. Aesthetically pleasing contemporary design in beautiful warm gray color. 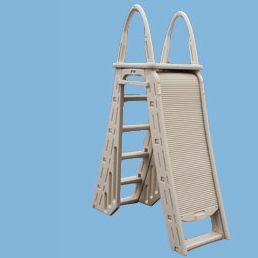 Fits 48" to 56" pools. Large 5 inch x 18 inch wide Comfortreads. Curved side rails designed with strength in mind. Inner side rails include integrated side barriers to prevent entry behind the ladder. Easy assembly with minimal hardware. No sand or bricks required; just fill with water.